How to display file preview within the FreeCommander window? Activating the menu item “View → Quick view panel” or the shortcut “Ctrl+Q” activates/deactivates the “Quick view panel”. The item, highlighted in the active panel, is shown in the “Quick viewer panel” separately. Where and how items are shown (according to their file type) in the “Quick viewer panel” can be defined under the menu item “Tools → Settings → View → Viewer”. How can I customize quick viewer? 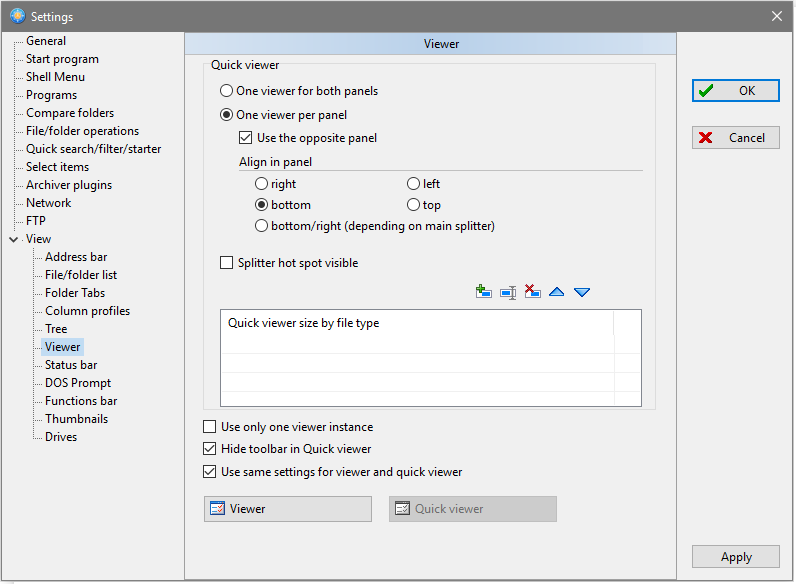 You can set the posiotion and other settings of the quick viewer (and viewer) in “Settings (F12) → View → Viewer”. How to close file preview? It can be closed by activating the menu item “View → Quick view panel”, or the shortcut “Ctrl+Q”. Alternatively you can add the toolbar button “Quick view panel” for any toolbar (Standard, Address, Splitter), to activate/deactivate the “Quick view panel” easily, by a single click.